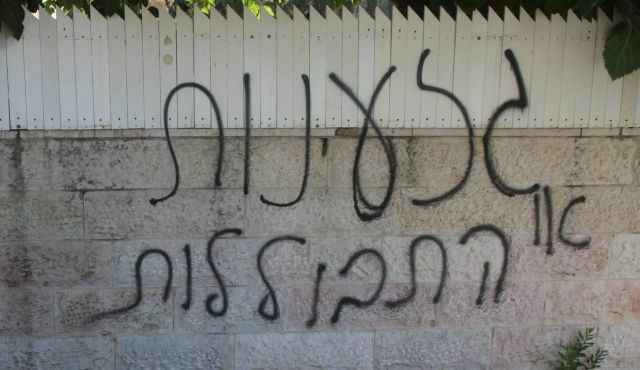 Channel 10 News, along with the rest of Israel’s major media outlets, immediately connected the incident to an amorphous group of politically motivated Jewish vandals which operates under the name “Tag Mechir” (Price Tag). Jews behaving badly consists mainly of spraying graffiti on the cars and homes of Arabs living in Judea and Samaria (West Bank). Their most detestable acts have involved vandalizing mosques. These fringe elements of Israeli society have been uniformly condemned by an overwhelming majority of the Jewish public. While the willingness of a tiny minority of Israelis to engage in violence against Arabs is reprehensible, it is important to keep in mind one small but often overlooked detail: they have killed no one. Indeed, Jewish criminal elements have engaged in virtually no acts of violence against humans. Yet, Channel 10 News and the rest of Israel’s liberal media continually equate the misdeeds of a few seriously disturbed Jews to terrorism. Apparently, the slashing of tires on 28 cars is on par with the September 11 attacks that took the lives of almost 3,000 people. Having eviscerated the distinction between thuggery and terrorism when it comes to Jewish perpetrators, Israel’s media outlets have been strangely mute with regards to the many cases of synagogues being vandalized by Arabs. On the rare and fleeting occasions when Arab vandalism is reported on, never does an Israeli media outlet label such attacks against Jewish targets as acts of terrorism. Why would Israeli news reporters engage in such acts of journalistic chicanery? If “price tag” vandalism in Arab villages is troubling, why aren’t the same people troubled by swastikas daubed on a Jewish holy place? It could be that Israel’s left-leaning media elite is feeling threatened by the rise of the conservative Israel Hayom, which has overtaken the liberal Yediot Aharonot as the country’s most widely read newspaper. With the left-wing monopoly in the press smashed, the rest of the liberal Israeli media has evidently been driven to distraction, more determined than ever to buck the tide of Israeli public opinion by clinging to and disseminating stale leftist tropes that the unwashed masses have long since abandoned. How much easier does it become to promote a two-state solution when the Jewish occupiers are on the rampage against the helpless Arab victims of the occupation! Sadly for Channel 10 News and the rest of Israel’s biased media, Israelis have proven to be too sophisticated to be influenced by them.